in one compact pedal and a controller —and of course an hommage to Carey Ann Moss . 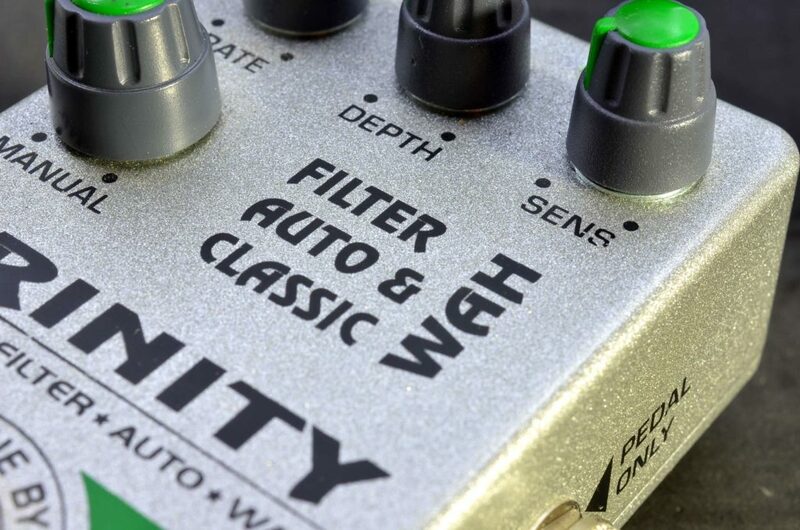 But not only this : thanks to its unique controler , the TRINITY opens a whole new field in effect pedals, allowing tones and sensations never experienced before. For once a new pedal is really new. Thanks to its dedicated dome controller , the TRINITY can be used as a wah-wah pedal. 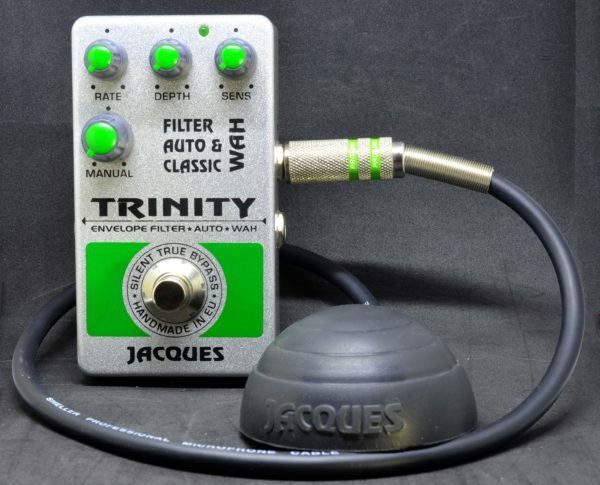 As unusual as it may seems —-the JACQUES TRINITY controller is made in a former military hardware factory—– anyone who have tried it feels immediately at ease with its utterly precise control over one of the most uncanny wah tone of all time. Try one and you will ask yourself why in this world bulky rocker pedals have been the classic choice for wah. and makes heads turn whenever you start playing it. 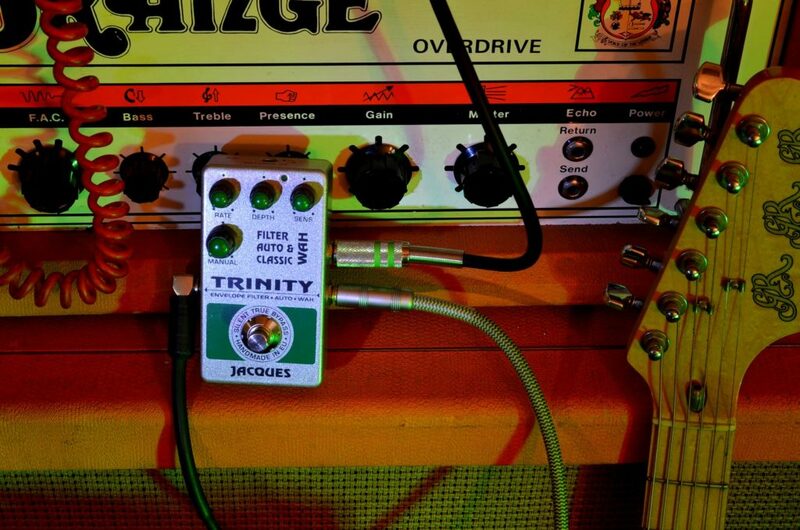 Due to its nature itself, there is nothing easier to get a stuck wah tone on the trinity. Furthermore, control on these favored guitar tone has never been so wide, from throaty ‘Money for nothing’ to squealing hard rock tones. You need it . 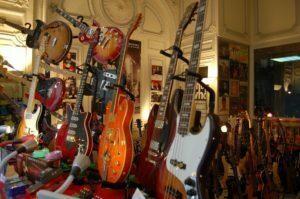 So why bother unstable drifting rocker pedal or expensive rack : the TRINITY will give you this famous tone stock without spending another dollar. And yes : Stock stuck wah. One of the most coveted effect of guitardom is the envelope filter. The best thing about the TRINITY filter is that it’s still a really dramatic effect while being usable in any setting. I wanted the whole to be pro-proof, and that you could get GREAT filter tone on the first second with the pedal. Simply adjust the sensitivity control to your guitar and playing tech and you’ll get your first brush with royal sibling enveloppe filter from France ! 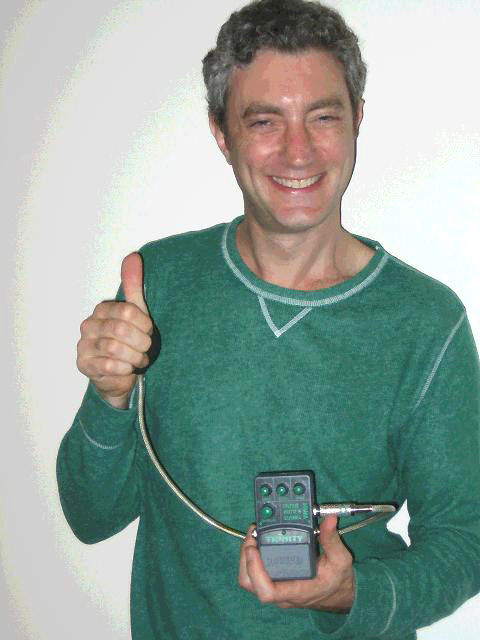 The TRINTY gets an inboard full functions autowah, with rate and depth controls. More than automatic wah, this effect is sent up to the boundaries with flanger and phasing , thanks to its incredible depth and musicality. Furthermore, the controler is still useful here, as it now slowly bypass this dramatic effects. You should try this. 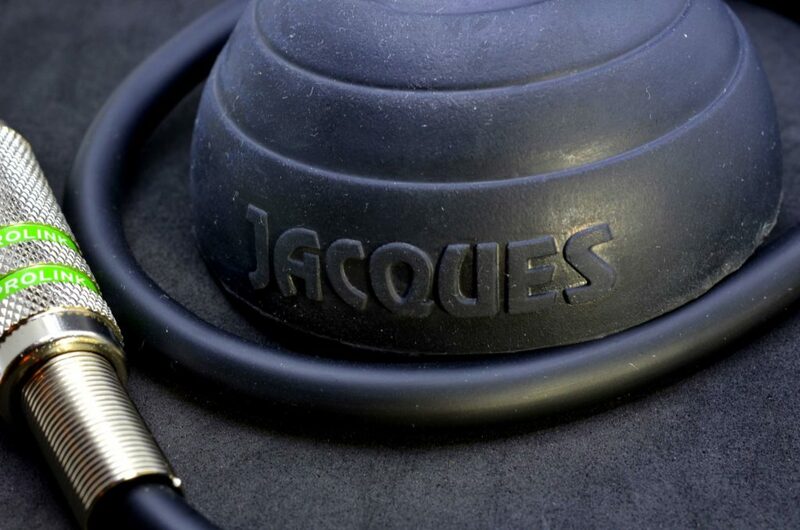 As a pure analog device, the TRINITY can anywhere between two settings, allowing literally hundreds of possible tones. I think this demo from my GREAT demoer Jean-Christophe PANZA will give already an idea of this panorama.